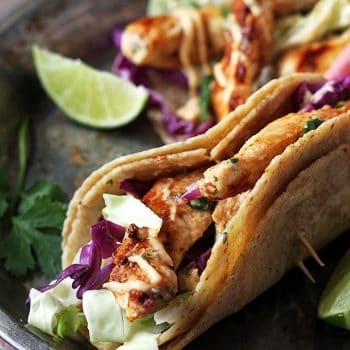 Easy Jamaican jerk chicken tacos, bursting with flavor and on the table in 20 minutes! These are perfect for busy weeknights! Season chicken breasts with jerk seasoning, rubbing into both sides. Cook over medium heat on the stove for 4-5 minutes on each side until cooked through. Slice into strips. Whisk together mayo and 2 teaspoons jerk seasoning. Assemble tacos. Place slaw/lettuce on each tortilla. Top with chicken, then drizzle with sauce. Top with chopped cilantro. Serve with fresh lime wedges for drizzling on tacos.